This book explains how to understand and analyze the working principles of optical systems by means of optical theories and case studies. Part I focuses mainly on the theory of classical optics, providing an introduction to geometrical and wave optics, and some concepts of quantum and statistical optics. Part II presents case studies of three practical optical systems that comprise important and commonly used optical elements: confocal microscopes, online co-phasing optical systems for segmented mirrors, and adaptive optics systems. With the theoretical background gained in Part I, readers can apply their understanding of the optical systems presented in Part II to the conception of their own novel optical systems. 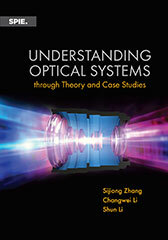 The book can be used as a text or reference guide for students majoring in optics or physics. It can also be used as a reference for any scientist, engineer, or researcher whose work involves optical systems. 1.2 How Do Light Sources Produce Light? 1.4.1 What are optical systems? 7.4 Core Components of the AO System and Related Algorithms? Optical systems have such broad applications that they can be found in countless scientific disciplines, industry, and everyday life. Many scientists and engineers whose work involves optical systems can use commercial off-the-shelf systems or build an optical system from the level of optical components. However, scientists and engineers who need to build customized optical systems must be able to understand the working principles of these systems and the components they comprise. With this requirement in mind, the goal of this book is to guide readers in acquiring an understanding of how and why optical systems and their related optical components work. The prerequisite for understanding optical systems is for readers to understand the optical theories involved in the systems. Then, armed with this understanding of the theory, readers can learn to analyze and understand these systems by studying some practical optical systems. An understanding of optical theories together with an examination of some practical optical systems will boost the reader to a higher level of expertise in building optical systems. Having worked in the field of optics for many years, we believe that a clear, global picture of optical theory is important for understanding optical systems, especially for conceiving new optical systems, which is our ultimate goal for readers. We also believe that the most effective and quickest way for readers to acquire the ability to analyze and understand optical systems is by studying examples of some typical optical systems. Based on the above tenets, this book consists of two parts: optical theory, involving mainly classical optics; and case studies of optical systems, involving mainly imaging systems. Three practical optical systems are provided to show readers how to analyze and understand the working principles of optical systems by means of optical theories. We expect readers to not only master the basic methods used in building the optical systems in the examples presented in the book, but also to be able to apply these methods in new situations and to conceive their own systems. This is where real understanding is demonstrated. The book is divided into two parts. Part I on Theory (Chapters 1–3) gives an introduction to geometrical optics and wave optics, and some concepts of quantum optics and statistical optics. Chapter 1 presents an overview of the properties and generation of light, a brief summary of optical theories, and some optical systems. Chapter 2 focuses on geometrical optics. Included in this chapter are the origin of the index of refraction, laws of reflection and refraction, perfect optical imaging systems, ray tracing, geometrical aberrations, and design of an achromatic double. Chapter 3 presents descriptions of wave optics. Topics covered are Maxwell's equations, wave equations, light waves and their characteristics, diffraction, interference, Fourier optics, wavefront aberrations, and resolution limits of optical imaging systems. Part II on case studies (Chapters 4–7) describes some important and commonly used optical elements and presents three examples of practical optical systems. Commonly used optical components are introduced in Chapter 4. Chapter 5 covers confocal microscopes, whose principle can be explained mainly using geometrical optics. Chapter 6 describes an online co-phasing optical system for segmented mirrors. The principle of the co-phasing optical system is expounded mainly by wave optics. Finally, in Chapter 7, a comprehensive example concerning an adaptive optics system designed and implemented by the adaptive optics group led by Sijiong Zhang is explained using both geometrical and wave optics. The advanced mathematics presented in this book are calculus, Fourier transform, and matrix operations. The book can be used as a textbook or reference for students majoring in optics or physics. It can also serve as a reference for scientists, engineers, and researchers whose work involves optical systems. We would like to express our sincere thanks to the numerous people who have contributed to this book. We are very grateful to many colleagues of Nanjing Institute of Astronomical Optics & Technology (NIAOT), Chinese Academy of Sciences, especially, the director of NIAOT, Prof. Yongtian Zhu, who supported us in writing this book. We thank Prof. Dong Xiao for closely reading the manuscript and giving many useful suggestions during the revision of the manuscript. We thank Dr. Yanting Lu for participating in the revision of the manuscript and writing its appendix. We also thank Dr. Bangming Li for writing part of Chapter 7. Additionally, we would like to express our sincere appreciation to SPIE, especially to Senior Editor Dara Burrows, and to the anonymous reviewers for their helpful and constructive suggestions to improve this book. Finally, the first author, Sijiong Zhang, would like to express his thanks to Prof. Alan Greenaway at Heriot-Watt University, Edinburgh for guiding him into the field of adaptive optics.